Okay everyone, today we are going to take a step forward in my procrastinating blogger life and show you part of our current living room, with my new living room flooring. GASP! I know, I am patting myself on the back too! We’ve lived here for almost 8 months and while we have taken HUGE strides forward, BUT absolutely no space is finished. What can I say, we live in a perpetual construction zone and I can only do what is bothering me most. I will liken myself to the princess and the pea… I may have 20 comforts in my home, but that one little pea, just digs at me until I fix it. Which means nothing is done in order. I bounce around from space to space and project to project. I have what you would call DIY ADD. I just can’t wait to show you how good the flooring looks! Don’t worry, I plan on going back and showing you all some of the steps it took to get to where we are right now. Also, I am SO excited to tell tell you about how Metroflor is hosting a giveaway on their Facebook page for $2500 toward a new Engage floor for you! NEED NEW FLOORS? Go enter! I will admit there is still a lot to be done in the space, including the fact that we haven’t even painted the walls yet. However, even though our living room is not finished, I LOVE the space right now! It makes me SO happy! 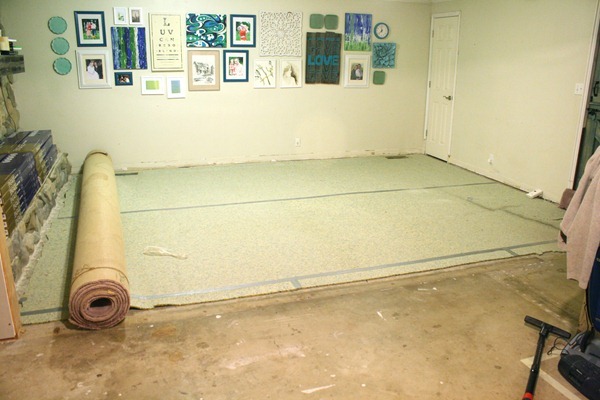 Getting a cohesive flooring is the foundation we have been waiting for, for months and months and months. We started by removing a wall with the help of a contractor friend. I will tell you more about that later. 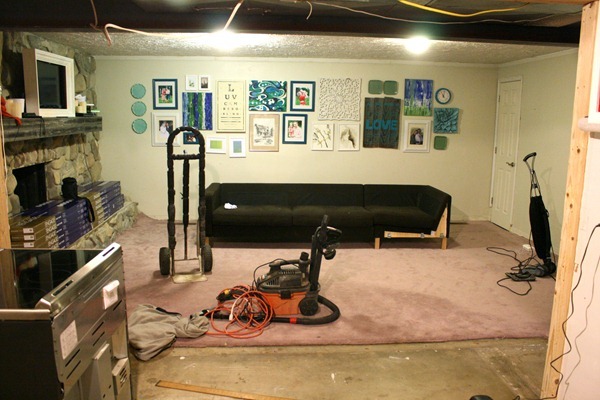 Removing all the furniture and flooring was a bit of a nightmare. And this was right when Justin and the kids first got the eternal cold that stayed with our family for like an entire month. so it almost killed us! 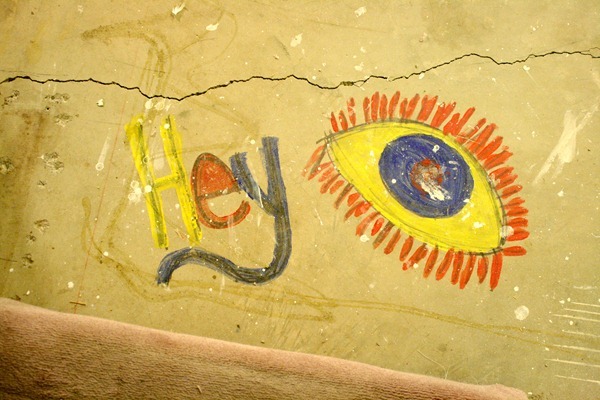 I found this little painting on the floor under the carpet. Since this is my family home, And this looks like my 12 year old style, I painted on everything… I think I might have done it. I am not quite sure what I was trying to say?! Anyway. The installer came the next day and we left the house to be out of his way. It was a hard and boring day with toddlers… I can tell you that. There was a lot of floor prep to be done, and our installer was heaven sent! He leveled and ground down the high spots it was a lot of work! And took most of the first day just to prep the floors. The fireplace stone was the biggest concern because the flooring calls for a 1/4 inch gap around the edges of the room, but who wants to see some strange gap. So he cut out a small groove under the stone and slid the flooring under it. Oh Looky! There may have been some dancing and shouting and generally crazy behavior! That followed at the end of the day! Okay well I hate to admit that it took us about 2 weeks to get the living room back together, but who am I kidding, this is real life. We were all sick and the living room just sat there with it’s beautiful flooring and almost nothing else. It is commercial grade and very durable! Totally Beautiful, this floor is downright HOT! I love the looks and style and width of the planks! We will show you a little more of the room next Tuesday for National painting week. Okay so tell me do you need new flooring? Please hop over to Metroflor’s Facebook page and enter the Engage with Metroflor Corp for a Chance to Win up to $2,500 Toward a New Engage Floor! Thanks Metroflor for making this post possible! I was provided with flooring for this space but all opinions about the flooring are my own. You’re right, that floor is HOT! Great job on the selection and install. I’ll have to put this on my To Do List. THANKS Jackie! I hope you go enter the giveaway if you have the chance! I need new floor badly. My dining area is cantalevered out. Our heat vent is in that bay, which underneath is just your soffit/facia board. I don’t think they sealed it off because the floor around the vent is purple. When googling it, I found out it was mold. Now up here in WI, the winters are cold. So that extreme temp change caused some condensation and thus mold. Now the whole floor needs to come up. While I wanted the linoleum replaced… Like your old house, I have all natural oak cabinets and woodwork. So, we are looking at hickory hardwood floors. (something different to break up all the oak) Never installed them before. I know we will have to cut and pull up the 1/4″ luan under layment and pull the linoleum up. Other than that, I haven’t the foggiest idea how to install. Michelle, Not sure I can help you with a hickory floor install… but you can go enter to win this flooring and I am loving it! GOOD luck! Your floor looks gorgeous. I was wondering if you could give any information about your sectional? Rita, It is just the Ikea Karlstad sofa! A great price! The flooring is just beautiful, I love it! I know you must smile every time you walk into the room now! Oh you have no idea what a difference it makes to our lives. I feel so much better about living in our home day to day. It mot only is clean and consistent, it is just BEAUTIFUL! Wow…your new floor is beautiful! I just love it. I’m going to enter for this giveaway right now. I sure could use it. Gorgeous dear, love your choice! Yes! We really do need to get together! Thanks Stacy! Wow, that floor is beautiful! We just installed an exotic wood flooring in our home, and boy is it a task to maintain its condition! But it looks great, so we can’t complain much. Jenna! Thanks for asking, I got them at Kirkland’s a year or so ago. I really love having them! Your new flooring looks amazing. I love the colour scheme of the living room. I bet you’re thrilled about the easier clean up! I love your floors! I even contacted metro floors and they sent me a few samples of the flooring. Since you have your new floors for awhile, how do you like them? Are they cold since the subfloor is concrete and how do they feel walking on them? 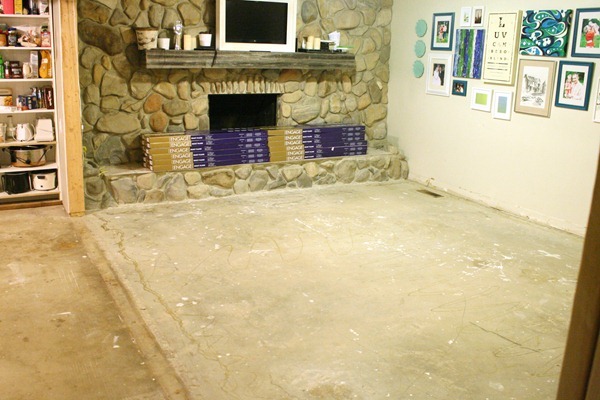 We have stamped concrete in our kitchen and carpet in our living room. It’s an open concept living/kitchen/dining/hallway. I’m just concerned about how it feels under foot. I can’t decide between hardwood or the metro floors. What do you think? Amy, I personally love the floors, especially when our girls spill on the floor and I don’t have to have a heart attach to rush and clean it up. It is water tight, and easy to clean. The floors are slightly cold, but that doesn’t bother us. It does feel different than wood, but I do prefer it over wood for the ease of cleaning it up from spills. It looks so beautiful…the whole room is fabulous. I really like the picture on the wall that looks like rustic boards with the word love on it. Where can I find out how to make one of those, or at least see it closer up? Yes, we made that a few years ago! Here is the link to the tutorial: https://www.remodelaholic.com/2011/04/rustic-vinyl-wall-decal-art-tutorial/ I will say that the vinyl has not held up well, it might be better to paint it on there! But the tutorial explains exactly how I made it. Love your floors! Can you give some details about them as I am interested in ordering for our bedroom? They are Engage Select Plank Woodburn Hickory by Metroflor. I can’t order them for you but there is the link! Good Luck! What is the color name for the flooring? Amy the color name is Woodburn Hickory and we love it. So, we had a minor flood and need to replace some of the flooring in the house we have been in for a year. I have been panicking about what to put down. I have 6 kids and a dog. I’m on a snug budget, want something that will last and be easy to clean, (and water spills are an issue) but also would love it to look “real”. I don’t want tile in those spaces and have been leaning towards laminate. However, the vinyl plank has been suggested to me about a million times now. What do you think? Has it held up? Do you still love it? How “fake” does it look? I would love your review. (or a link to where ever you already reviewed it) Thanks again. What an inspiring site! The floor has held up great. We love it and we get a lot of good comments about the look of it when we have people over. It really doesn’t look fake at all. They did a great job to make it look like real wood. we are still remodeling around the house and the floor has help up very well with all the projects going on. I hope that helps. We would have this floor in a basement again for sure. Just picked up my Engage Plank Flooring in Brownville Oak. 24 cases was suprised how heavy a carton is with only 10 planks inside. Excited to get my kitchen and hall ways done. That is great. We love that flooring sooo much. you will love having it. Especially in your kitchen. i have a sample of this and love it, but your pics look lighter. Which picture of yours shows the true overall color of your flooring? I would say that the last four pictures of the flooring are the closest.